A biography of Charles A. Eaton was written by J. Ronald Miller in 1993 called Prophet in the House. It was published by Community Church Press in Chicago. Clearly Cyrus S. Eaton was greatly influenced by Charles Eaton, his uncle, but only 16 years older. Like his father Stephen, Charles became a Baptist minister. He introduced his nephew to his parishes John D. Rockefellar in Cleveland. Always, Charles put first the well-being of his parishioners, his New Jersey constituents, and the peoples devastated by war in Europe and World War II. He was chosen to be a signer of the United Nations charter, and he was instrumental in "shepherding" the Marshall Plan through the House of Representative as Chairman of the Foreign Affairs Committee. He never compromised his principals or his efforts to seek peace and end war. Charles Eaton preached at Wilson Memorial Church in 1915. His biographer was senior pastor here from from 1961 to 2006. In 1920, he wrote…"The fundamental idea of our American civilization is this: any man who has the stuff in him can, by his own energy, thrift, industry and courage, rise to any height he may choose. His only limit is his own weakness. For Troubled Hearts by Charles Aubrey Eaton 1899 - Sermons published at Baptist Church in Toronto where Charles was minister. 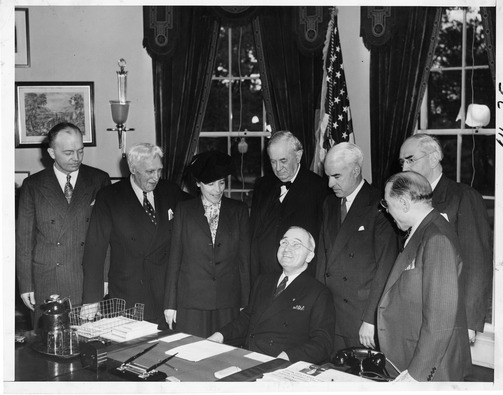 President Harry S. Truman (sitting) meets in the Oval Office of the White House with the American Delegation to the United Nations Conference in San Francisco, California. Delegation members from left to right: Commander Harold Stassen, Representative Charles Eaton of New Jersey, Barnard College Dean Mrs. Virginia Gildersleeve, Senator Tom Connally of Texas, Secretary of State Edward Stettinius, Senator Arthur Vandenberg of Michigan, and Representative Sol Bloom of New York. From the scrapbooks of Matt Connelly, Vol. 1. EATON, Charles Aubrey, (1868 - 1953)EATON, Charles Aubrey, (uncle of William Robb Eaton), a Representative from New Jersey; born in Nova Scotia March 29, 1868; attended the public schools; was graduated from Acadia University, Nova Scotia, in 1890 and from Newton Theological Institution, Newton Center, Mass., in 1893; pastor in Natick, Mass., 1892-1895, Toronto, Canada, 1895-1901, and Cleveland, Ohio, 1901-1909; moved to Watchung, Somerset County, N.J., in 1909; pastor of the Madison Avenue Church, New York City, 1909-1919; sociological editor of the Toronto Globe, Toronto, Canada, 1896-1901; associate editor, Westminster, Toronto, Canada, 1899-1901; head of the national service section of the United States Shipping Board Emergency Fleet Corporation from November 1917 to January 1919; editor of Leslie's Weekly in 1919 and 1920; elected as a Republican to the Sixty-ninth and to the thirteen succeeding Congresses (March 4, 1925-January 3, 1953); chairman, Committee on Foreign Affairs (Eightieth Congress), Select Committee on Foreign Aid (Eightieth Congress); was not a candidate for renomination in 1952; died in Washington, D.C., January 23, 1953; interment in Hillside Cemetery, Plainfield, N.J.
Link to web page with information on Charles Eaton, his wife, his daughter, and Cyrus S. Eaton -- accuracy not fact checked.